At the Wellcome Centre for Anti-Infectives Research, we have made an exciting discovery about a group of life-threatening parasites. Proteins are vital for almost every process that keeps cells alive. DNA is the code which tells our cells which proteins to produce. The code in the DNA is converted to proteins through an intermediate step involving a messenger molecule called RNA. Both the DNA to RNA and RNA to protein steps provide ways for the cells to control how many copies of each protein are made. In humans and other animals, the quantities of each protein are primarily determined at the first stage of communicating this code, as DNA is copied into RNA. We now know that this is different in trypanosome parasites. These cause deadly diseases such as Sleeping Sickness, Leishmaniasis and South American Trypanosomiasis. In their cells, protein abundances are determined at the second stage, as messenger RNA is decoded into protein. Finding differences between humans and parasites could help us make new medicines against the invaders. 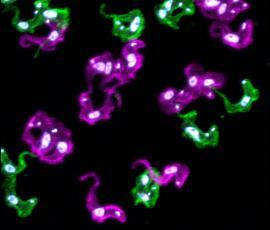 This discovery will also allow us to learn more about RNA and protein abundance in parasites. This is another vital part of the puzzle in understanding how they work. Professor David Horn said, “This highlights a major difference between parasites and us. We can now estimate the abundance of any trypanosomatid parasite RNA or protein with some degree of confidence. The insights should be of value to researchers interested in understanding protein expression control or the evolution of the underlying mechanisms. It will also be useful to those of us developing new medicines against these deadly parasites”. Citation: Codon usage bias controls mRNA and protein abundance in trypanosomatids. Jeacock L, Faria J, Horn D. Elife. 2018. 7. pii: e32496.